The John Muir Trail is one of the most spectacular stretches of trail in the world. The JMT traverses the High Sierras of California for 210 miles over high mountain passes and through pristine wilderness dotted with alpine lakes. It’s a rewarding challenge like few other trails in the world. Obtaining permits will be your first big hurdle, but don’t let that deter you, the JMT should be on every hiker’s bucket list. Of all the trails we’ve hiked, the JMT is one of our all-time favorites. One of the most important considerations for thru-hiking the JMT is determining what gear to bring. Unless you’re a seasoned long-distance hiker, your backpacking gear will probably be on the heavy and bulky side for a trip like the JMT. We recommend channeling your inner thru-hiker, digging into our lightweight backpacking videos, and really dialing in your gear well before your hike. Your goal should be to pack as light as possible while still remaining safe and comfortable. For more comprehensive information on planning and logistics, check out our Complete Guide to Hiking the John Muir Trail. The John Muir Trail is incredibly beautiful, but also incredibly challenging. Most days you’ll be hiking 2,000 feet up one side of a mountain pass, just to hike 2,000 feet down the other side. Then rinse and repeat. For this reason, we really can’t stress enough how important it is to keep your pack weight to a minimum. Trust us. When you’re sucking air at high elevation, climbing to the top of a burly mountain pass with a backpack seemingly full of bricks, you’ll really wish you had packed lighter. We try to keep our base weight (everything in your pack minus food and water) at no more than 15 pounds, so our total pack weight will never get above 25-30 pounds. Dialing in your gear can be expensive, time consuming, and feel overwhelming, but we promise it’s well worth it. Improving your gear will make your 2-3 weeks on the JMT far more enjoyable, and you’ll be much more likely to make it to the finish. The ability to hike long distances comfortably. This allows you to take fewer breaks and cover many more miles in a day. Light packs allow you to hike with your head up, see more of the sights, breathe fully, and spend less time hunched over staring at the trail. You’ll also feel far more nimble and coordinated on the trail, avoiding stumbles and walking at a brisk pace. A light pack will allow you to wear lightweight footwear, which will also save a ton of energy, help you avoid blisters, and feel far more comfortable. Light packs makes big climbs and descents much, much easier. A lightweight pack will put less stress on knees and joints, which will help you avoid injury. And importantly, backpacking with a lightweight pack will help improve overall mood and morale, so you’ll have more fun. Which is really what it’s all about. What Gear Should I Pack? Your tent will be one of the four heaviest items in your backpack, so it should be one of the first places you look to keep weight down. Non-freestanding: Thru-hikers often choose ultralight, single-wall shelters that are non-freestanding to keep tent weight to a minimum. They take longer to set up, may have some interior condensation, and can be tricky to pitch on hard ground/rock, but they’re usually far lighter than traditional shelters. This could be a good choice for the JMT, which is a challenging trail, but tends to be fairly dry in peak season. Freestanding: If you’d prefer a more convenient option and are willing to carry some extra weight, you may find that a double-wall, free-standing tent will be a better fit. Just make sure to get a lightweight/ultralight model, because some freestanding tents can be very heavy. For the more casual backpacker, this tends to be the most popular choice. A lightweight freestanding tent will be fairly foolproof and can be used for backpacking, car camping, and everything in-between. Tent Recommendations: The Zpacks Duplex and Triplex (pictured below) are our top picks for non-freestanding ultralight tents. They’re top of the line thru-hiking shelters, but they’re also pretty expensive. If you’re looking for a freestanding tent, our top pick would be the Big Agnes Copper Spur UL2 & UL3. We love the convenience and comfort of the Copper Spur, and they’re among the lightest freestanding tents on the market. As far as what size to choose, we generally prefer 3-person ultralight tent models and use them as a roomy tent for two people (the Triplex or UL3 for example). Though 3-person models weight a bit more than 2-person models, they provide a much more comfortable interior space for two. If you’re traveling solo or don’t mind tight living quarters, you’ll likely want a 1P or 2P tent (like the Duplex or UL2). Though these are two of the best backpacking tents on the market, there are many other tent options for hiking the JMT. Check out our Best Lightweight Tents list and Best Ultralight Tents list if you want to shop around some more. Most of the John Muir Trail is at high elevation, so nighttime temperatures can dip fairly low, even during summer months. If you’re hiking in early spring or late fall, you’ll have a high likelihood of below freezing nighttime temps. At the same time, your sleeping bag will be one of the heaviest and bulkiest items in your pack. For this reason, it’s really important to find a good balance between weight and warmth in your sleeping bag. Temp rating: It’s also important to remember that the temperature rating listed on most sleeping bags and quilts tends to be highly optimistic. For example, a sleeping bag with a 20°F “lower limit” rating will keep you alive at 20°F, but it won’t keep you warm. The “comfort rating” is the measurement you actually want to pay attention to, and it tends to be about 10° higher than the lower limit rating. So, a 20°F sleeping bag should keep you comfortable to right around freezing (32°F) or a little below. Quilts: Quilts are a good option because they have excellent warmth to weight ratios, but they also tend to be more drafty. In addition, we find that most quilts are even less realistic in their temperature ratings, so we add an extra 20° when we calculate comfort ratings for quilts. For example, we expect a 10°F quilt to keep us comfortable to right around freezing (32°F) or a little below. Recommendations: For most backpackers, we think 20°F sleeping bags and 10°F quilts are the best fit for hiking the JMT during peak season. In hot summer weather you may want to bump up 10°, or in frigid early spring / late fall you may want to bump down 10°, but in general those are good baselines. Check out our Best Lightweight Sleeping Bags & Quilts list for more recommendations. Your sleeping pad is another key area to consider when trying to keep weight and bulk to a minimum. With chilly nighttime temperatures in the Sierras, you’ll also want to ensure you’re insulated from the cold ground. We recommend choosing an insulated sleeping pad with an R-value of around 3 or higher. Our top pick among backpacking sleeping pads is the Therm-a-Rest NeoAir XLite, which offers exceptional warmth and comfort for its weight. If you’re a cold sleeper and you’re hiking during shoulder season, you may even want a 4-season pad with an r-value rating of 5 or higher, like the Therm-a-Rest NeoAir XTherm. Those are our top picks, but if you want to see some other options, check out our Best Sleeping Pads list. Your backpack will also be among the heaviest items you’ll carry, so it’s critically important to choose a light and comfortable pack. And remember, your backpack is just a way to carry all your other gear, it doesn’t have to be overly complicated. Just comfortable and functional. We prefer minimal lightweight backpacks that weigh around 2 lbs. or less. There are also many solid backpacks in the 2-3 pound range, but we wouldn’t recommend choosing a pack that weighs over 3 pounds for the JMT if you can avoid it. The key to going with a lightweight pack is keeping your other gear weight and bulk to a minimum. Lightweight packs have simple frames that are excellent with weights around 25-35 lbs. But if you load them down with much more than that, they’ll quickly become uncomfortable. And that’s okay, you don’t want to be carrying more than 35 lbs. Our top recommendations for lightweight backpacks are the Hyperlite Mountain Gear 2400 & 3400 (pictured below), Gossamer Gear Gorilla 40 or Mariposa 60, and the ZPacks Arc Blast (but only your ultralight gear is super dialed in - 10 lb base weight or less). For more of our favorites, check out our Best Lightweight Backpacks list. The JMT is very well-maintained and well-traveled. It’s a surprise to some, but on trails like this we almost always wear trail running shoes (learn more: 5 Reasons to Ditch Your Hiking Boots). Unless you have weak ankles, chronic foot/ankle pain, or are planning to encounter winter snow conditions, we’d recommend you do the same. We hiked in Saucony Peregrine 8's and Brooks Cascadia 13’s and they were great. Many (if not most) of the other hikers we encountered on the JMT were also wearing trail runners. That said, shoes are always a very personal choice, so make sure to go on plenty of training hikes and find what works best for you. Hiking in trail runners goes against traditional backpacking ethos and can be controversial, but we don’t make this recommendation on a whim. 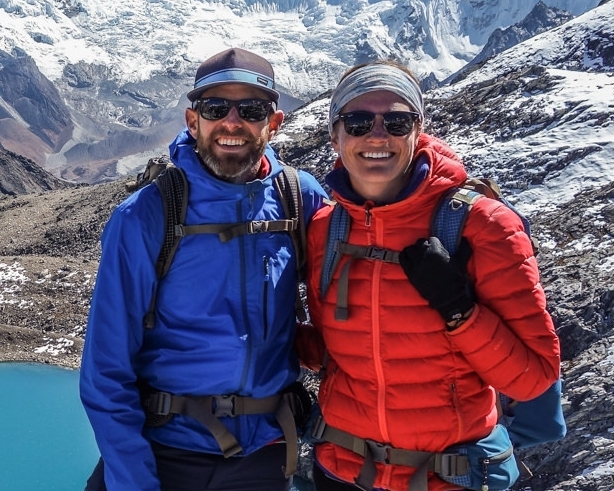 We’ve hiked thousands of miles in trail runners on some of the most rugged terrain on the planet (Nepal, Patagonia, the PCT, and dozens of other places). In our experience, the pros of trail runners heavily outweigh their cons, especially when compared to hiking in heavy boots. If boots work better for you or plan to encounter winter snow conditions, make sure to choose lightweight boots and break them in well before your trip. For more recommendations on hiking footwear, check out our Best Hiking Shoes and Boots list. Compared to most mountain ranges, hiking in the Sierras during peak season tends to be clear and dry. That said, we’d never recommend traveling into the backcountry without adequate rain gear. Protecting against hypothermia is one of your most important safety considerations. That said, you won’t need a heavy mountaineering rain shell for this trail. Instead, we recommend choosing a lightweight rain shell and pairing it with a warm puffy coat (more on that below). Our current favorite rain coats are the Arc’teryx Zeta FL and the Patagonia Stretch Rainshadow. If you’re looking to go as minimal as possible, the OR Helium II is also a good option. For more of our recommendations, check out our Best Backpacking Jackets post. As far as rain pants go, consider them an optional item to bring only if you’re expecting very cold and wet weather. If so, we recommend the Mountain Hardwear Stretch Ozonic or Montane Minimus rain pants. A lightweight and warm down jacket is a key piece of gear for any backpacking trip. Even on warm summer backpacking trips, as soon as the sun goes down you’ll want to throw on your puffy. A good backpacking puffy is lightweight, warm, and can pack down very small. Some of our favorite down jackets are the MontBell Plasma 1000 Alpine Down Parka and Mountain Hardwear Ghost Whisperer. For warmer summer trips, we really love Patagonia’s synthetic Micro Puff Hoody. For more recommendations, check out our Best Backpacking Jackets post. A lightweight fleece can be very useful in a backpacking layering system. On cold and wet trips, a fleece will come in handy because it will stay warm when wet and can be used under your puffy coat and rain shell. For summer backpacking trips on the JMT, we likely wouldn’t bring a fleece jacket. But on shoulder season trips with low temps and possibly moody weather, we definitely would. Some of our favorite lightweight fleeces are the Patagonia R1 Fleece Hoody and Outdoor Research Deviator Hoody. 1 Pair long john bottoms - optional, for nighttime use. Ok, so now we’re starting to sound like a broken record, but we can’t stress enough the importance of keeping weight to a minimum on a trip like the JMT. Your camp kitchen setup is another key area to consider weight. If you prize speed and convenience, an integrated canister stove system, like the Jetboil MiniMo, Jetboil Flash, or MSR WindBurner could be a good option. But on a strenuous trip like the JMT, we chose to cut about half the weight and brought the BRS Ultralight Stove and Snow Peak Mini Solo Cookset. That option isn’t as fast, easy, or fuel efficient as a Jetboil, but it’s lighter and less bulky. You could also use a popular, durable, and trustworthy canister stove like MSR PocketRocket 2 and pair it with any ultralight pot system. For more options, check out our Best Backpacking Stoves list. If you're preparing your own meals or enjoy a cup of coffee in the morning, you'll want to pack a simple lightweight cup, which can double as a bowl for meals. You'll also want to bring a durable spoon. We like the Snow Peak Folding Spoon, which has a long handle for eating out of freeze dried meal pouches, but also folds up for easy storage. We plan simple meals in the backcountry, so we don’t bring a fork, and if we need a knife we have our swiss army. Hiking the JMT is hard, calorie-burning work. You’ll need a lot of calories to sustain your energy and health on the trial, but food is an area that many people tend to overpack. Because you’ll be on the trail for 2-3 weeks, you’ll need to stop and “resupply” a few times along the trail (more info on resupply in our Complete John Muir Trail Guide). As you begin to prepare your food plan, we suggest checking out our Lightweight Backpacking Food Guide. Lightweight meal options such as freeze-dried meals, mashed potatoes, couscous, and other easily rehydrated foods are common on the trail. We recommend packing calorically dense foods such as chocolate, olive oil, peanut butter, and nuts to supplement your meals. Remember, variety is key in your food plan - you don’t want to be 4 days in and hate all the food in your pack. It’s important to not only consider weight, but also bulk on your JMT hike. You’ll have to fit all of your food into a bear canister so you’ll want to avoid food that is too bulky, like bagels and chips. To help with food prep, we recommend repackaging food items into zip-loc bags. Water is plentiful along the JMT and easily accessible from streams and lakes. You’ll want to carry enough water to get from one source to the next and a lightweight water filter or purifier. Most of the water sources in the sierras are clear and free of sediment, so we chose to use a SteriPEN Ultra as our main water purification method. The SteriPEN is lightweight, works fast, and doesn't require any pumping, squeezing, or chemicals. It’s battery will cover about 5 days worth of water for two people, but we also brought a lightweight power bank (Jackery Mini) and Chlorine Dioxide Pills just in case. Another very popular and affordable option is the Sawyer Squeeze Micro, which is lightweight and convenient. Whatever purification method you choose, we recommend bringing some Chlorine Dioxide Pills as a backup for if your main filtration system malfunctions, clogs, breaks, or loses battery. Check out our best water purifiers list for more recommendations. A small headlamp like the Petzl Actik is an affordable, bright, and lightweight option. That’s what we’ve been using for the past couple years and they work great. Make sure to test your headlamp batteries before you set out and bring a small backup light source if your smartphone doesn’t have one. Finding the right camp pillow can make all the difference in getting a good night’s sleep. After years of wobbling around on inflatable pillows, we’ve found our favorite pillow is the HMG Large Stuff Sack Pillow. It’s featherlight and comfortable with a soft fleece layer against your face. We stuff our down jackets into the pillow and that makes them feel as close to the pillows on our bed at home as we’ve found. We don’t usually hike with trekking poles, but many hikers along the JMT do. There’s a lot of elevation gain and loss on the JMT, so many find them helpful in reducing strain on their knees during long ascents and descents. If you’re using an ultralight shelter system, trekking poles can also double as your tent poles, which will save some weight. For some trail-tested recommendations, check out our Best Trekking Poles list. Before you step foot on the JMT, you’ll most likely have spent many hours planning and preparing for your hike. Throughout this process, you’ll find there are hundreds of resources on the topic. We found that the John Muir Trail: The Essential Guide to Hiking America's Most Famous Trail and accompanying John Muir Trail Data Book were instrumental in helping us prepare and plan. Although we decided to leave the Data Book behind due to weight, we still used it extensively in our planning phase. Almost every hiker you run into on the John Muir Trail will have the Guthook JMT App downloaded on their phone. It’s a great GPS resource that’s user-updated to give on-trail information regarding water sources, campsites, and other helpful tips. Be aware that the Guthook app occasionally has campsites listed that do not follow National Park or LNT guidelines. Always ensure your campsite follows Leave No Trace guidelines to minimize impact. You’ll be hiking across some of the most beautiful terrain in the US, so there’s no sense in capturing such breathtaking beauty with your phone. That said, we also don’t recommend hauling 10 pounds of camera gear on the trail. We absolutely love our Sony RX100 VI for trips like the JMT. This camera is widely considered the best point-and-shoot camera ever created. It’s got a huge sensor for a camera its size and an excellent zoom. If zoom isn’t super important to you and you’re looking to cut the cost significantly, the Sony RX100 III is also a great option. A bandana and the Nano pack towel are great for cleaning up after a day on the trail. Proper hygiene will not only keep your tentmate happy, but you’ll feel far better and more refreshed as well. Remember, never wash directly in water sources. That’s harmful to wildlife and the ecosystem. Instead, walk 200 feet away and take a 1-2 liter water bottle shower using your bandana as a washcloth. We do this every day after hiking and it feels great. You’ll need to pack in and pack out all of your toilet paper on the JMT. We recommend storing it in a small ziplock bag to make sure it stays dry, while also packing an additional ziplock for trash. When going #2 on the trail, always use a trowel and dig a proper cathole at least 6-8 inches deep. Remember to find a place 200 feet from water sources. There’s also a section of trail in the Whitney Zone where you’ll need to do your duty in a WAG bag and carry it out. It’s actually not as gross as it sounds - there’s a deodorizer in the bag which neutralizes its smell. If you’re picking up your permit in Yosemite, they may give you a wag bag kit to carry with you on your hike. You’ll understand why this is so necessary when you see how many people visit the Whitney Zone every day. Poo takes a long time to decompose at high altitude and nobody wants a minefield of catholes. All JMT hikers must carry and store all their food and scented items (toiletries, trash, etc) in an approved bear canister for the entire route. We both carried the Bear Vault BV500 Food Container and it was a great size for our resupplies. At night, simply place your locked bear canister about 100 feet away from your campsite. Just make sure to avoid placing it near rivers, lakes, or cliffs. Though most people store bear canisters inside their backpacks while hiking, we found it convenient and comfortable to strap them to the top of our backpacks. Just be careful with any food you don’t want to melt in the sun (chocolate, etc.). We always hike with a small 1 oz. container of hand sanitizer in our hip belt pockets. We use it before snacks and meals, as well as after going to the bathroom. This is a great way to avoid gettin sick on the trail. We used to travel with a small bottle of Campsuds too, but we stopped bringing it due to negative environmental impacts and we don’t miss it at all. Depending on the time of year, mosquitos can be ferocious on the JMT. July and August are typically the worst months for bugs and the worst locations are typically Tuolumne Meadows to Edison Lake, and the Rush Creek drainage. If you’re going to be hiking the JMT during the spring or summer, we recommend being as prepared as possible. Spray your clothing with Permethrin prior to your hike and carry a small container of Picardin Lotion (our choice) or DEET to protect yourself. If we’re going on a backpacking trip for more than a couple days, we usually carry a small, lightweight power bank. Items such as your phone, camera, SteriPEN, or headlamp may all run out of battery, so it’s good to have a backup. We like the Jackery Mini Power Bank and it has come in handy quite a few times. A small personalized first aid kit is essential for all backcountry trips. We use the Ultralight .7 Kit and add extras, like painkillers and personal medications. Adding extra bandaids to your kit is also a good idea for a trip like the JMT. Sun protection is an absolute must for every backpacking trip. Even on cloudy days you’ll want to wear sunglasses (Ray Ban Polarized New Wayfarer are our faves), sunscreen, and SPF lip balm. Tenacious Tape is a fantastic tool that should go with you on every backpacking trip. It can quickly fix a popped sleeping pad, a tear in your tent, or seal up ember burns in your puffy coat. We also bring a small roll of duck tape (wrapped around a pencil, lighter, or water bottle) for quick gear repairs or heavy duty blister protection. We brought along a small Swiss Army Knife which came in handy from time to time. Some hikers consider tools like this optional, but we think it's always good to have a small knife and a few tools (tweezers, toothpick, can opener etc.) on the trail. Sleeping in a wet sleeping bag is the pits. So always waterproof the important gear inside your backpack on rainy days. We bring a large garbage bag or two in case the weather turns foul and we need to line the inside of our backpacks. We also like using lightweight waterproof stuff sacks for organization, which makes waterproofing easy. Our favorites are HMG Waterproof Stuff Sacks and S2S eVAC Dry Sacks. You’ve scored a JMT permit - congrats! That’s no easy feat. Now make sure you have that bad boy on you and in an easily accessible location, because you’re going to need to show it to many park rangers along the way. Don't forget things like a travel toothbrush, toothpaste, contact lenses, personal medications, and any other small toiletries you may need. Although you'll most likely be exhausted after long days of hiking, we always found it great to have some lightweight entertainment with us. We wrote in our Rite in the Rain All-Weather Journals almost every night. There were a few people with Kindles on the trail as well. We hope this packing list was helpful in preparing for your trip along the spectacular John Muir Trail. Below are more resources to help prepare for your thru-hike and dial in your gear. We also recommend checking out our Complete Guide to Hiking the JMT.